Those items collecting dust in your home have no useful purpose. All clutter does is cause you a lot of stress and anxiety. It ruins your mood and even has a negative impact on your health. Decluttering opens up space and lets more sunlight into your home. Suddenly, your home is a more peaceful, calming place to live. It really isn’t as difficult as you think. All it takes is the right approach and the best tools. At the end of the job, you should have only what you need and what is useful. You probably won’t create a perfect home no matter how much you declutter. Start with the goal of making it better and making your home more organised. Once you get to that point, you can maintain it with much less effort. It isn’t about doing a whole home makeover. It’s just about getting rid of things you no longer need. The most important tool you need is a skip. A large part of clutter ends up going into the trash. A skip provides adequate space and makes disposal easy. Consider the areas in your home that lack organisation. Storage bins come in a range of sizes and materials. They make it easier to keep pieces together and out-of-sight. Take a good look at every area of your home. What kinds of storage tools will help the things you keep look less cluttered? Think about baskets, shelves, canisters, and other storage tools that will make it easier to organise everything. You can find almost anything online these days. That includes storage and organisational tools. If you can’t come up with solutions on your own, search for tips with pictures online. Sometimes you need a little help from the pros to figure out the best way to get organised. It’s also a great way to find the lowest prices on the tools you need. Anything that’s worn, broken, or outdated needs to go into the trash. Other items might have a lot of use left. Hire a Sydney mobile skips service so you don’t run out of space. Consider what to do with the rest. You can donate some items to charity. If you have things with sentimental value or clothes that don’t fit, give them to someone you know will use them. Keep recyclables separate, too. Have a plan for what to do with everything when you start. Don’t give yourself an excuse to throw anything back into the closet. Use minimal planning and then get started. It probably won’t be as bad as you think. The sooner you jump into the mess, the sooner you can enjoy the progress. You spent a lot of years collecting all your clutter. It’s going to take some time and effort to get rid of it. The most important thing is to make progress. Find a designated area to put items that you or your family use regularly. If the decluttering job takes longer than expected, you don’t want to end up searching for socks or dishes! Don’t go back and forth from one spot to the next. Working on a single bookcase or closet makes it easier to make progress. Actually seeing the area change in front of you will encourage you to keep going. Start with the things you can throw out. The more you toss into the skip, the less you have to sort through. This includes things like stacks of magazines, books, crafts you never started, or 8 track tapes! If it has no value, toss it out. Women frequently have two or three sets of clothing at any time. Those that fit now, the ones that used to fit, and the ones you plan to wear after you drop a few pounds. Some experts recommend getting rid of anything you haven’t worn for a year or longer. If you’re having trouble letting go of some old favourites, take the time to try them on. Be honest about how they look and feel. It’s worth the extra time you spend working on your closet the get rid of more clutter. Don’t let things pile up. Throw trash into the skip and don’t give in to the temptation to drag anything back out. Deliver donations and items you want to give away to their destination. If you pile them up in a different room, it’s still clutter. 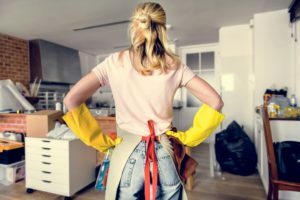 Once the clutter is gone and you have lots more space, it’s the perfect time to do some major cleaning. Add a new layer of paint where needed, too. Now that all that clutter is out of your way, you can actually see your floors and walls! The best time to create a system of organising your home is while you declutter. Create a space for everything and place everything in its space. If it still needs work after the clutter is gone, go back through and take an objective look. Where can you condense, straighten, group, or put out of sight? If you have a lot of clutter in your home, keeping things you don’t need is probably a lifelong habit. You need to make an effort to keep your system going. That means trading in old habits for new ones. Try to put things back where they go every time you use them. You can also set a certain day of the month as your ‘mini-decluttering’ day to get your home back in order. Once you realise how much better having a neat home makes you feel, you won’t want to go back to the messy home you had before. When you get ready to declutter your home, contact Sydney Mobile Skips to book your skip service. We offer same day service with skips that fit down driveways, inside garages, and in underground carparks. Give us a call and get started decluttering today!